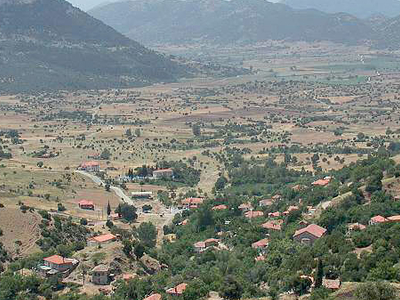 Achaea is one of the regional units of Greece. It is part of the region of West Greece. It is situated in the northwestern part of the Peloponnese peninsula. The capital is Patras. The population exceeds 300,000 since 2001.Achaea borders on Elis to the southwest, Arcadia to the south and Corinthia to the southeast. The Gulf of Corinth lies to its northeast, and the Gulf of Patras to its northwest. The mountain Panachaiko (1926m), though not the highest of Achaea, dominates the coastal area near Patras. Higher mountains are found in the south, notably Aroania (2341m) and Erymanthos (2224m). Other mountain ranges in Achaea are Omplos and Movri. Its main rivers ordered from west to east are the Larissos, Tytheus, Peiros, Charadros, Selinountas and Vouraikos. Most of the forests are in the mountain ranges, though several are in the plains including the extreme west. There are grasslands around the mid-elevation areas and barren lands in the highest areas.